An improvement of the old model both in terms of design and looks. The Instincts are known to be all-round climbing shoes that can perform on anything, but the SR model's slipper design lends itself to bouldering and indoor climbing. Medium asymmetry with moderate downturn, 3.5 mm of XS Grip2 rubber, and a soft midsole make the Instinct SR perform well on everything whilst retaining comfort, highly sensitive, and very good at toe and heel hooking. New features include an M50 rubber heel construction and a larger area of toe rubber. This makes the Instinct SR even better for heel and toe-hooking than before. Plus, the 5 panel microfibre upper, REB reinforced elastic closure with seamless big toe panel, and seamless four-toe panel provide the best custom moulding fit. Rubber compound built for pure friction, recommended for use where maximum grip is the primary need - bouldering and sport climbing, indoor climbing, or extremely smooth, polished routes. 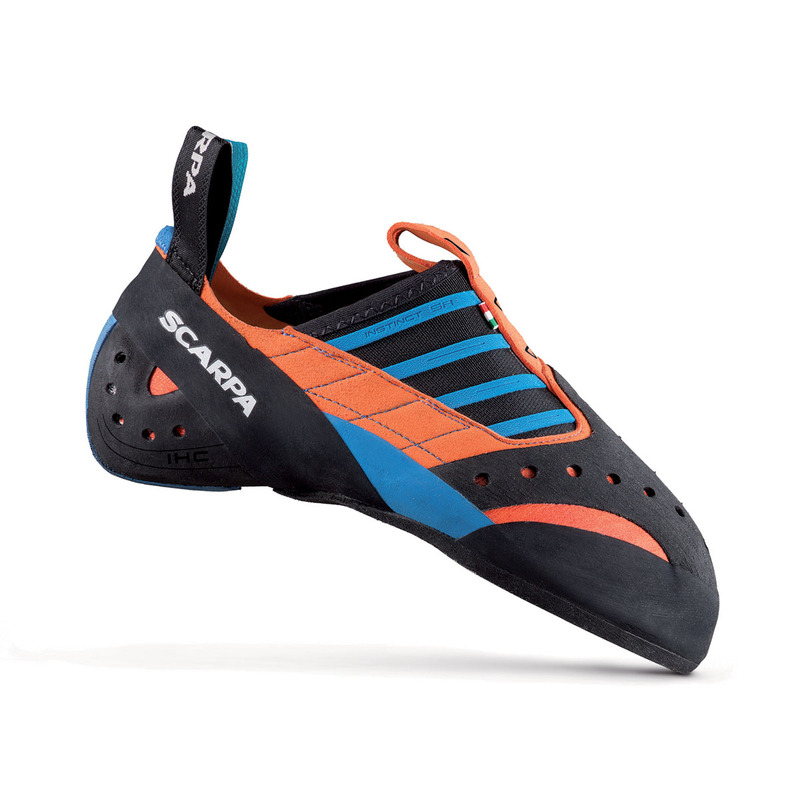 Before ordering these shoes, I had tried on a friend's pair of Scarpa Instinct VS (size 42 EU). They were awfully tight compared to my Scarpa Origins (size 44), but they still fit and I could stay on the wall for a solid minute or two without them hurting a lot. Due to his stretching a bit, I though 42.5 would do the trick. When they arrived I tried them on and they were too small, and I soon realized the toe box and upper quarter of the shoe is a bit different in the slippers. I exchanged them for a 43, which definitely still hurt a lot, but not nearly as much as the first. Now for the one problem... the middle fin that comes up from the toe started to peel just a few days after I got them. It's not that big of a deal, but it really angers me that after years of producing climbing shoes Scarpa have still not figured this out. I still love these shoes, and after a couple of weeks in the gym, I them extremely comfortable. With the sticky toe wrap I can now pull off the dirtiest heel/toe hooks. Very, very, very, nice shoes. I bought them when i needed to replace my Instinct S shoes, and they did that just perfectly. Toe hooking is just as good if not even better. At the begining the heel didn't feel that good, so I was a bit dissapointed, but after a few weeks the "feel for the heel" was improving significantly, and now it's the best I have ever tried.